spring loaded scroll pens manufacture,exporter,wholesaler and supplier with stable quality, rapid delivery time and competitive prices to support your promotional business. Delivery door to door worldwide! Paypal and credit card accepted for small orders. Our company has been a professional promotional gifts supplier, exporter and manufacturer since year 2006.
roll out ink pens manufacture,exporter,wholesaler and supplier with stable quality, rapid delivery time and competitive prices to support your promotional business. Pens with built in banners manufacture,exporter,wholesaler and supplier with stable quality, rapid delivery time and competitive prices to support your promotional business. 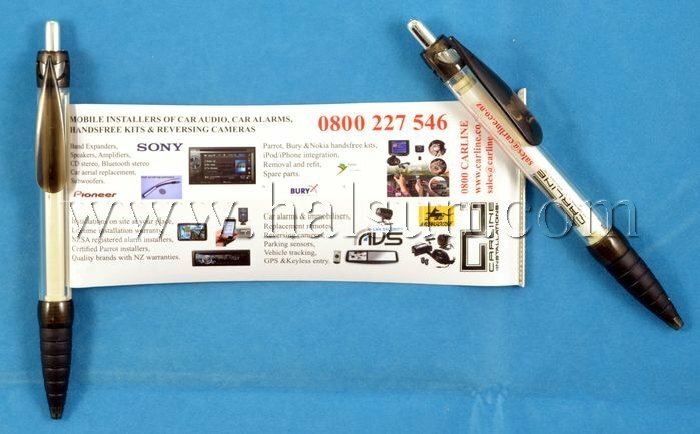 Merchandise pens with paper scroll is an advertising/promotional pen. Can pull the banner out to see more details of the sponsor's informations. The pull out/roll out banner can sized up to 168*68cm, and can be printed on both sided (front and back) in full color offset color. Click the above image to see big pictures with details. The Promotional Merchandise pens with paper scroll is a Unique New Concept! Pen Paper Pulls out Logo, is the ultimate promotional pen to promote your corperation. Originally patented almost 30 years ago and still leading the industry for the best price versus performance ratio. Print your promotional message on both sides of the retractable material and give your customers a reliable pen that will ensure your promotional message keeps working for you a long, long time after rollout. Unlike traditional giveaways that people swiftly forget about, the promotional Pen Paper Pulls out Logo is something that will keep on selling, informing and educating your prospects for months. Each time they pull out the brochure to show colleagues and friends, relevant information about your business, products or services will be displayed. Remember it is hard today to find a promotional product that really catches peoples attention but also has a useful function. Importantly the Pen Paper Pulls out Logo is an inexpensive option compared to many other promotional pens. More than just a pen, it's a promotional billboard too!